We are open late June thru late August. On season you must call because we are so busy! 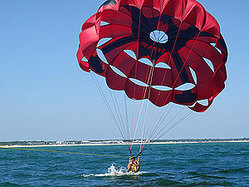 "My family of six went parasailing with you on Tuesday and had the greatest adventure! Everyone from my youngest, who is 6, up to my mother-in-law, who just turned 65, went up in the parachute and had a blast. The smooth take off and landing made the flight super easy and the view of the Cape was like nothing I could have imagined! My oldest was a little nervous but your crew explained everything and made us all feel so comfortable and safe. The experience of the Captain was obvious as he skillfully dipped our legs in the water before landing us back on the boat. We also purchased the picture package which came out fantastic. The look of delight on my family's faces said it all. We will be back again next summer!" "My fiance and I rented three jet skis from you in July and just wanted you to know how happy we were with the trip. Your crew, equipment, and location are all top notch. Those wave runners are fast! I spent the hour jumping waves. My fiance took it easy and just cruised around and enjoyed the warm water. None of us had rented wave runners before so we were very happy with the detailed instructions and help that your crew gave us before and during the rental. We spent the whole night talking about the skis and for sure will be back to see you again." "What a day! We parasailed, rented jet skis, and even took a banana boat ride! I have to say we were glad we had made reservations in advance when we saw how busy you were. I can understand why...everything was so much fun! I didn't even know there was anything like this on Cape Cod. What a rush. Your crew was awesome. Everyone was super helpful and eager to get us on the water and enjoying the activities. One guy even jumped in the water to help my son back on the ski! The Parasail experience was like non other...flying high above the ocean, waving to people on the beach, we never wanted to come down. The Red Jacket is a beautiful resort and the parking made everything so accessible. Thank you so much and we will pass the good word out to all our friends looking for summer fun on Cape Cod." "Can't wait to show my friends the pictures of me in the parasail on Facebook! Best summer vacation ever!" "No one back home is going to believe how fast my Dad and I went on the jet ski!" "My cousins and I rode the banana boat all together. We kept telling the Captain more waves! I would ride it ever day! We laughed the whole time."